The Kahutara Hall in 2010. 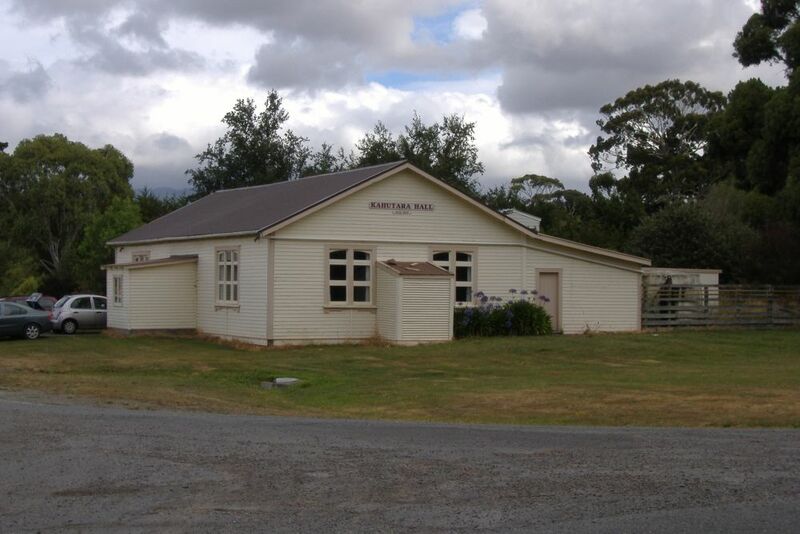 The main hall was part of the Soldiers’ Club, Featherston Military Camp. The remainder was on-sold to the Pirinoa community which also wanted a hall. Pirinoa Hall, opened by MP Alexander McLeod on 9 September 1921, was destroyed by fire in 1933, soon after to be replaced. Kahutara’s new hall was erected, with stage and dressing rooms added, for the opening on 14 September 1921. A supper room was also attached about 1923. Dances at the hall were frequent, with busloads arriving from Featherston, Martinborough and Greytown. As with most country halls, it hosted all manner of occasions – card playing, private parties, district farewells, Country Women’s Institute, indoor bowls, gymnastics. It was the venue for religious services and Sunday school. A small-bore rifle club was using the hall as a range by 1924. Hall lighting was electrified about 1926. In World War Two the hall was the headquarters of the local Home Guard company until it disbanded in late 1943. Kahutara School was also a regular user. Kahutara Hall continues to be used by the community. According to several local histories, nearby Pihautea Hall was constructed of wood from demolished buildings at Featherston Military Camp.